I contacted the digital distribution manager at my label's distributor. He had a conference call with an iTunes rep and asked how we go about putting an LP together. He was told that LPs aren't being offered to indies and that there are only about 12 LPs being offered right now. They also said that iTunes charges a $10,000 production fee for them as well. So that pretty much edges out the indie market completely. But if they're charging ridiculous, prohibitive fees and only letting a few major labels take advantage of this—you know, the ones that iTunes needs to keep happy to be a viable music store, not the ones that might actually make something artistically interesting with LP—that romantic cry for the return of the album (it's more like the return of the Digipak, anyway) sounds a cynical and disingenuous. More to the point, it'll forever doom LP to gimmickry, because, well, the Dave Matthews Band can only carry you so far. —Thanks, Brian! 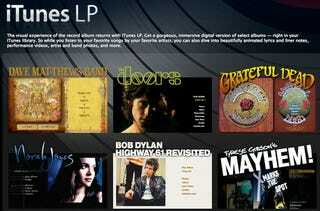 We're releasing the open specs for iTunes LP soon, allowing both major and indie labels to create their own. There is no production fee charged by Apple. So, with the open specs in place it seems like indie labels (or any other label) will be able to create iTunes LPs as much as they want, and not at a mandatory $10k a pop.